Global platinum mine supply remains constrained, with South African producers facing the challenges of not only a low-price environment but also rising costs, regulatory uncertainties and safety stoppages. Creamer Media’s Platinum 2017 report provides a global overview of the platinum market and an outlook for the sector, with a particular focus on South Africa’s platinum-sector business environment. The report focuses on the main participants in South Africa’s platinum industry, other platinum producers, and exploration and development companies. Despite sizeable gold reserves and high-grade orebodies, South Africa’s gold production has stagnated in recent years, with figures from the World Gold Council showing that the country’s gold production, which amounted to an estimated 167.10 t in 2016, remained virtually the same as the 167.20 t produced in 2015. This has positioned South Africa as the seventh-largest gold producer in the world, a position where some have speculated it is likely to remain. In this context, Creamer Media’s Gold 2017 report reviews the global gold market, with a particular focus on the South African gold sector, including issues, such as supply, labour, and electricity shortages, which are affecting the sector. It also reviews the major and smaller mining companies with operations in South Africa. Creamer Media's Energy Roundup is a monthly report providing a synopsis of energy-related news from South Africa in the past month. The May 2017 roundup covers activities across South Africa in April 2017, and includes details of the Council for Scientific and Industrial Research’s formal input into the Integrated Resource Plan public consultation process; the Western Cape High Court’s ruling on government’s controversial nuclear power expansion programme; and Public Enterprises Minister Lynne Brown’s rejection of State-owned power utility Eskom’s board proposal to grant former CEO Brian Molefe a R30‑million pension payout. The South African economy remains subdued and the domestic project economy strongly reflects this feeble status. Although the National Treasury is forecasting public-sector infrastructure spending of R947.2-billion over the coming three years, the figure includes a number of megaprojects being built by State-owned companies (SoCs), which are well under way. The SoC’s are projected to invest R432.8-billion over the period and remain a major part of this public-infrastructure story. However, their balance sheets are generally stretched, which has resulted in some entities leaning more heavily than initially expected on their government guarantees. The upshot is that, until these entities stabilise or growth returns, there is little likelihood that they will be in a position to initiate major new projects. The list of major public-sector projects in the planning phase, as published in the Budget Review, also does not suggest an immediate turnaround. In the private sector, meanwhile, the overall weak economic climate is undermining business confidence, which is also being weighed down by policy and political uncertainty. Consequently, private fixed investment remains under pressure. However, the recovery in commodity prices could help stimulate some fresh activity, albeit mostly brownfield in nature. What is certain, is that a material recovery in business confidence will be required if private-sector investment is to return in earnest. Nevertheless, the first edition of the Projects in Progress for this year still includes valuable updates on some of South Africa’s largest infrastructure projects, as well as ongoing investments in the gold, coal and platinum sectors. Creamer Media's Energy Roundup is a monthly report providing a synopsis of energy-related news from South Africa in the past month. The April 2017 roundup covers activities across South Africa in March 2017, and includes details of the Coal Transportation Forum’s application to the High Court for an interdict against State-owned power utility Eskom; Public Enterprises Minister Lynne Brown's call on Eskom to urgently complete socioeconomic-impact assessments for its coal-fired power stations in Mpumalanga; and Eskom’s new nuclear build programme. The iron-ore price astounded analysts in 2016 by recovering from a 2015 average of $55.30/t to end the year at more than $80/t. While the rally continued into 2017 – with the price exceeding $90/t in February, the highest since August 2014 – many market watchers are not convinced that the current level is sustainable and expect a pullback before the end of the year. Creamer Media’s Iron-Ore 2017 Report provides an overview of the global iron-ore market over the past year, with particular emphasis on supply and demand, trade and pricing. It provides not only information on the major global iron-ore producing companies and other significant producers, but also an overview of South Africa’s iron-ore market and its major producers. South African new-vehicle sales decreased for the third consecutive year in 2016, with domestic sales down 11.4% year-on-year to 547 442 units, compared with 617 648 units in 2015. The National Association of Automobile Manufacturers of South Africa has attributed the decline in domestic new-vehicle sales to above-average price increases, higher interest rates, low consumer confidence and pressure on consumers’ disposable income. Creamer Media’s Automotive 2017 Report provides an overview of the industry in South Africa over the past 12 months. The report provides insight into local demand and production, trade and investment, competitiveness in the sector, as well as environmental considerations. A lack of adequate electricity supply in recent years has had a negative impact on the South African economy. Power shortages have hindered economic growth and negatively affected business confidence. Generation capacity issues were at the heart of the electricity supply woes, but a strong operational turnaround by the country’s main supplier, Eskom, has improved prospects. The State-owned power utility has progressed from implementing regular load-shedding as recently as mid-2015, to an average electricity surplus of about 5 600 MW at peak by the end of 2016. Creamer Media’s Electricity 2017 Report examines Eskom’s turnaround, providing an overview of its generation developments, capacity expansion and financial status; the role of independent power producers; electricity planning, distribution and electrification, among other topics. Creamer Media's Energy Roundup is a monthly report providing a synopsis of energy-related news from South Africa in the past month. 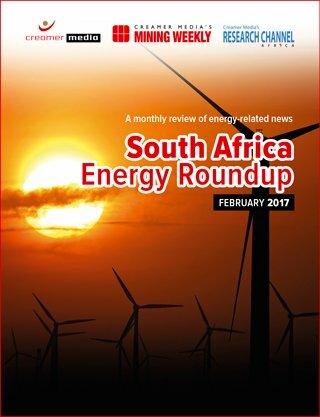 The March 2017 roundup covers activities across South Africa in February 2017, and includes details of the redacted Dentons report into the operational and financial underperformance of State-owned power utility Eskom, which was requested by the company’s board in 2015; the Presidency’s support for the country’s Renewable Energy Independent Power Producer Procurement Programme; and the Organisation Undoing Tax Abuse’s call for the unbundling of Eskom. The report is a summary of information published in Engineering News and Mining Weekly, as well as of information available in the public domain, and does not purport to provide an analysis of market trends. Creamer Media's Energy Roundup is a monthly report providing a synopsis of energy-related news from South Africa in the past month. The February 2017 roundup covers activities across South Africa in December 2016 and January 2017, and includes details of the Post-2015 National Energy Efficiency Strategy; the connection of State-owned power utility Eskom’s first power-generating unit of the Kusile coal-fired power station to the grid; and Eskom’s interruptions in bulk supply to some nonpaying municipalities.